Below are some presentations that are intended to help others learn about the various aspects of ham radio. If you would like to present this tutorial to your club or organization, a PDF version of the presentation is available for download. 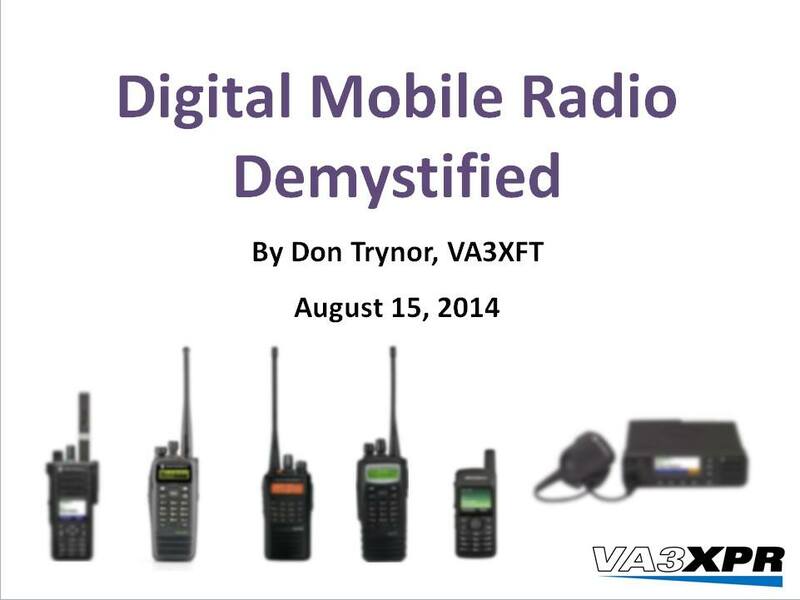 The Digital Mobile Radio Demystified presentation provides an excellent overview of Digital Mobile Radio and is targeted toward less tech-savvy audience. Topics include an overview of the DMR standard, the benefits of using DMR, how hams are utilizing DMR around the world, plus how users or repeater owners can get started with DMR. Perfect for a ham radio club meeting! Number of slides: 30; Recommended presentation allowance time: 60 minutes. The IRLP & EchoLink Made Easy presentation is a great way to learn all about IRLP and EchoLink operation, whether using an HT, PC or smartphone and is intended to help ham radio operators make the most of this great hobby.